If you've been following me thru my Facebook page, you'll know that Sofi has been sick the past week. And so is Isha. Sofi had fever, acute toncilitis, headache, vomiting episodes. We had cbc and urinalysis to determine the cause but we got a negative result for dengue (THANK GOD!!!). Our pedia said it could be viral. Isha also had to cancel her monthly vaccination last September 30 due to cough and colds. But they're better now. Yaaay! I know all parents can relate na ang hirap magkasakit, let alone if it's your babies. My husband and I had an alternate schedule at night to monitor Sofi's on-off fever. Everywhere you go you can hear someone coughing and sneezing. :( Viruses like that can spread easily and it's hard to control. Good thing us parents now have a partner in fighting off these viruses by boosting our children's immune system. UNILAB's Ceelin is one of Sofi's vitamins ever since until now. She missed a few times that's why I think bumaba ang immune system nya. Now she knows better than to missed taking her daily dose of vitamins. And today I'm so happy to announce that UNILAB our partner in arming our kids with the right vitamins has partnered with us to celebrate #TeamSofIshaGiveaway! Woohooo!!! 4 winners will win these amazing set of UNILAB products! 2. 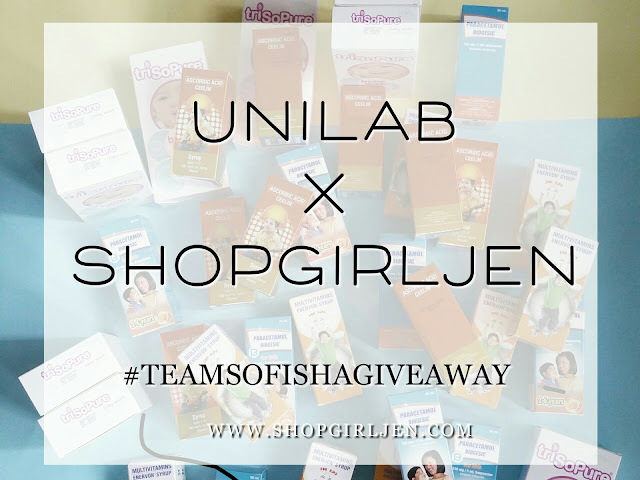 Share (the photo below) in your Instagram and Facebook with caption: I trust UNILAB in providing quality healthcare for my kids http://www.shopgirljen.com/2017/10/unilab-x-shopgirljen-giveaway.html #UnilabXShopgirlJen #TeamSofIshaGiveaway #ShopgirlJenGiveaway then TAG 3 of your friends. 4. Comment below in this order: Name, Instagram/Facebook handle, Link of your post. Make sure your post is in public. That's it! This giveaway is open nationwide and will end on November 12, 2017 at 11:59PM.